View all posts listed under Industries. If you’re into making wine as gifts for the holiday season (or for sale), then you can create your own wine labels for your wine bottles with blank printable labels on laser and inkjet sheets. Worldlabel has over 50 label sizes for you to choose from, including downloading a label template for each size in Word or Adobe. Our WL-Ol450 and WL-Ol550 labels are the most common size labels used for wine bottle labeling. Once you visit those links above, you’ll discover that we supply our blank labels over 30 different materials including clear and glossy materials. If you do not see the size you need by using our “visual search for labels” or through our bottle labels page, please let us know. 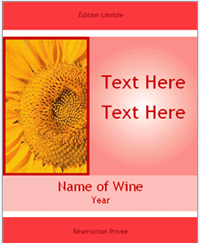 We can supply you with a custom size and also have the capability to design, create and print wine labels for you. This entry was posted in Industries, Labels & Printing and tagged Wine label on December 17, 2008 by wlmanager.